REDDING, Calif. - Simpson University Athletic Director Joe Griffin announced this week that he will be moving to Indiana to serve as director of athletics at a college there. 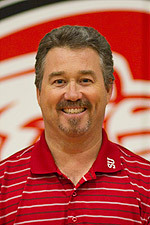 Griffin joined Simpson University’s athletic staff in August 2007. During his tenure, Simpson added six sports teams and saw its number of student-athletes increase from 109 to 241. Several Simpson teams won California Pacific Conference championships for the first time in university history; two teams are currently ranked in the top 15 in the national NAIA (National Association of Intercollegiate Athletics) ranking for the first time; and the wrestling team has placed seven wrestlers on the NAIA All-American team over the past two years. “We greatly appreciate Joe’s contribution to Simpson University athletics over these last seven years,” said Dr. Rich Brown, vice president for Student Development. Griffin’s last day will be Aug. 5. Student-athletes comprise 30.5 percent of the undergraduate student body at Simpson. The Red Hawks compete in the California Pacific Conference in 12 sports – men’s and women’s soccer, cross-country, golf, and basketball; women’s volleyball and softball; and men’s wrestling and baseball. The athletic program has dual membership in the National Association of Intercollegiate Athletics (NAIA) and the National Christian College Athletic Association (NCCAA).